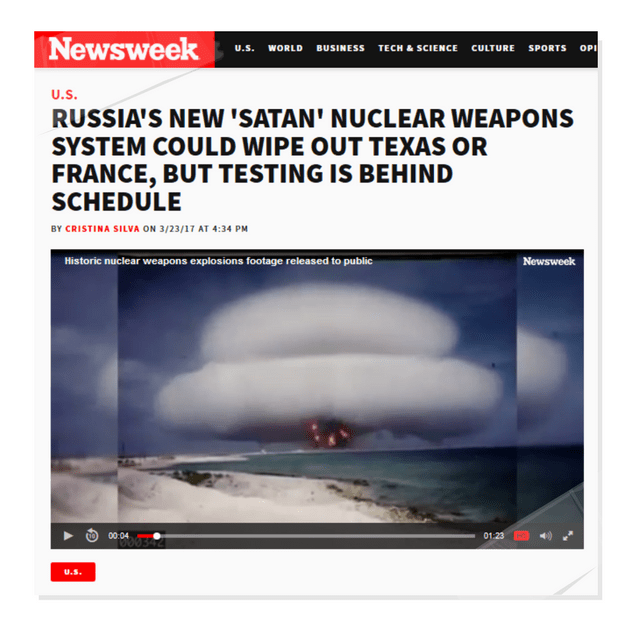 Russia has for months been testing a giant nuclear weapons delivery system that can carry 10 heavyweight warheads—enough power to wipe out Texas or France. But the RS-28 Sarmat intercontinental ballistic missile known in Russia as “Satan 2” has been delayed yet again, suggesting Moscow is having a harder time than expected updating its nuclear arsenal. Russia began testing the Sarmat last year and had been expected to enter it into service in 2018. It was slated to be Russia’s first new intercontinental ballistic missile in decades and much bigger than its U.S. counterpart, the Minuteman III, which carries three warheads.